Almost all of the lions in the wild live in Africa, specifically in the south Sahara desert and in portions of southern and eastern Africa. However, there is a small population of Asiatic lions living in India within the Gir Forest National Park, a wildlife sanctuary. 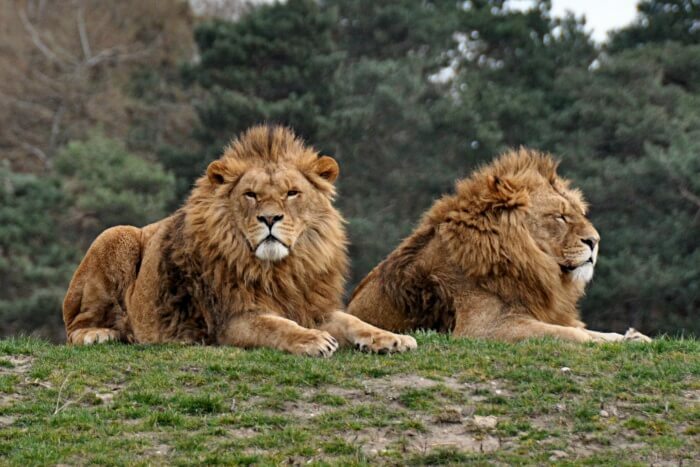 In the past, African lions roamed throughout most of Africa, and Asiatic lions were found in a wide area stretching from the Middle East to India. There were also lion populations in Greece and other parts of southern Europe. Today most wild lions live in the countries of Angola, Botswana, Mozambique, Tanzania, the Central African Republic, and South Sudan in sub-Saharan Africa. The lion’s range has gotten smaller as its habitat has been taken over by humans for agriculture and residential areas, or fragmented by roads. Some population groups have died out due to hunting by humans and diseases spread by dogs. The lion’s territory continues to shrink as humans move into their habitat. This leads to both direct habitat destruction as well as a loss of territory due to a general reduction in the lion population. When humans move to areas where lions live, more negative interactions occur between the lions and the human population. This often results in lions being directly killed by humans to prevent the lions from hunting livestock or harming the human population. Lions have become regionally extinct in seven African countries where they previously lived, and their general population is estimated to have decreased about 40% in 20 year period from 1990 to 2010. The lion’s habitat consists of grasslands, scrub and open forests. This type of terrain provides easy access to the large animals that lions need for food. Grasslands, also known as savannas, are home to large herds of wildebeest, antelopes and zebras, which provide easy hunting for groups of lions. In open forests or woodlands, lions have easy access to buffalo, giraffes and rhinoceros for food. The scrub habitat includes areas of desert with patches of dense undergrowth that provide the lions with shelter and protection. Lions live in groups called prides, and each pride roams over a territory of up to 100 square miles. The large territory is required to provide enough food for all of the pride members. The males in the group protect the territory, keeping out other lion prides as well as other predators that might reduce their pride’s food supply. The females in the group work together to hunt prey animals in the territory, providing food for all members of the pride. Many of the populations of lions in Africa are geographically separated from each other. As of the early 21st century, there were only around 1000 lions living in West Africa, and they had no contact with other lion populations. Other lion populations are isolated in their homes in various game preserves and national parks in different areas of Africa. These areas protect lions by reducing their interaction with humans, but also fragment their habitat limiting interaction between groups. Some of these preserves include Natosha National Park in Namibia, Kruger National Park in South Africa and Serengeti National Park in Tanzania. The Ewaso Lions Project maintains several natural preserves to protect lions in Kenya. The Asiatic subspecies of lion only lives in Gir Forest National Park reserve in India as of 2017, but plans are in place to establish another Asiatic lion population at the Kuno Wildlife Sanctuary, which is also in India. In addition to their wild habitat, lions live in zoos and nature preserves around the world. The Association of Zoos and Aquariums has a species survival plan for lions that helps coordinate conservation efforts between zoos. Lions in zoos typically live in naturalistic environments to mimic their wild habitats. These homes provide room to roam, space for dens and elevated areas where the lions can sun themselves and keep an eye on their territory as well as trees or other structures for shade.